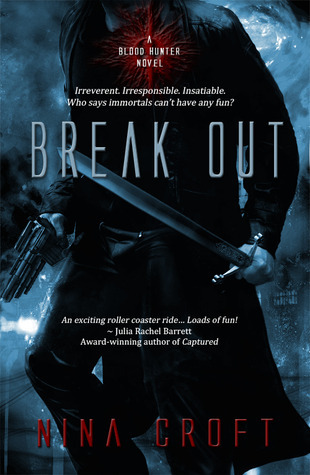 Reader Girls is very proud to be participating in the Virtual Book Tour run by Bewitching Book Tours for Nina Croft's latest novel, Break Out: Book One of the Blood Hunter series. Science fiction. Romance. Vampires. Ms. Croft's newest book encompasses all three genres and has already been generating stellar reviews for a title which was only published yesterday by Entangled Publishing (go check out Entangled Publishing's website--their titles look and sound aah-mazing). 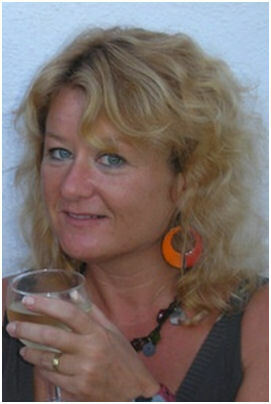 The author also has a guest post to share with us about her cast of characters. Who says immortals can't have any fun? Doesn't the cover art make you wonder about the face that goes with that leather clad body and those weapons? We welcome Nina Croft. My novella, Break Out is a bit of a hybrid. It’s a science fiction, paranormal, romance. It’s also book 1 of the Blood Hunter series. The series gets its name from a space ship—a mark 3 space cruiser—El Cazador de la Sangre, which means Blood Hunter in Spanish. And the series follows the fortunes of the crew of El Cazador. I seem to spend a lot of time talking about Rico, the hero of Break Out, so I thought I spend a bit of time introducing the rest of the crew, along with Rico. Captain: Tannis is the captain of El Cazador (Rico likes having his own space ship but doesn’t want the responsibility of being captain—he’s not the responsible type). She’s also Rico’s best friend—well actually his only friend. Tannis is a GM or genetically modified, she’s mostly human but with a little bit of snake DNA in there (doesn’t show much except she’s long and thin, with luminescent skin and yellow eyes). She’s fiercely loyal to her crew but more than a little mercenary and has an annoying (or so Rico thinks) tendency to sarcasm when she should be providing sympathy. Cabin Boy: Al is the cabin boy. Al is a bit of a mystery. They picked him up starving on an out of the way planet a few months ago. Apart from that, they don’t know much about him except that he’s terrified of Rico (which drives Rico spare—it’s not as if he makes a habit out of eating the crew—he has some standards). Systems Specialist: Janey looks after the ships computers, hacks into everyone else’s, and comes up with really nifty gadgets. I’m a technophobe (along with the rest of the crew of El Cazador) so I don’t really understand what she does—but she’s very good at it. She’s also perfect—perfect hair, clothes, make-up—she’s the sort of woman you’d hate if she wasn’t so nice. Engineer: There’s not much to say about the Trog, because nobody knows much about him, and he keeps to himself down in the engine rooms. So there they all are. Each book in the Blood Hunter series will focus on a member of the crew and how they find love. Break Out is Rico’s story. It was easy for me to pick which crew member I wanted to write about after Rico, but who do you think should be next to find love on El Cazador? We thank Nina Croft, Bewitching Book Tours and Entangled Publishing. Sounds like a great cast! Can't wait to read it! I love finding out about the other characters....They each sound funny and fascinating in their own rights. Let's see??? ?who's next to find love? My money is on Tannis. The synopsis had me at immortality and earth no longer being habitable. Sounds amazing! I'm going to check it out right now! Hope you enjoy it, Heather! And I agree, the next should be Tannis! Daniela - don't tell me I got my maths wrong - off to find a calculator - no it's right!